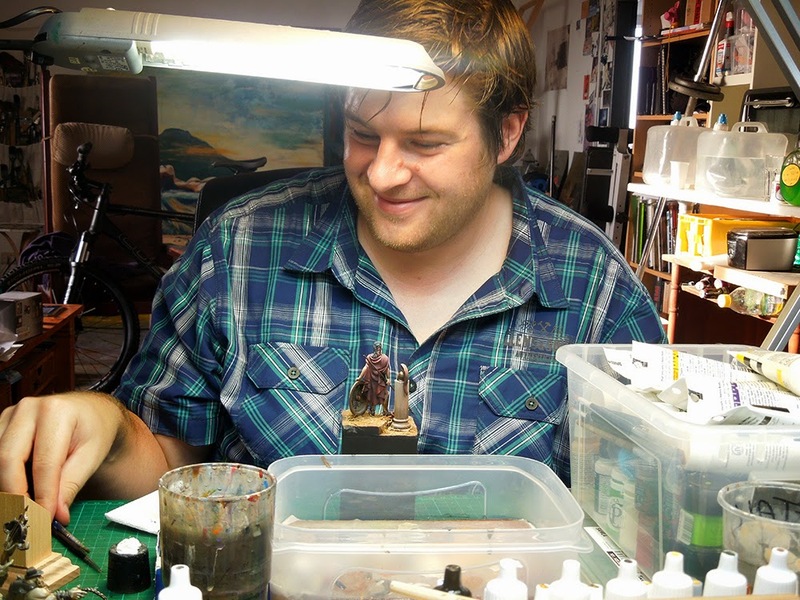 Tutorial Voting: Hope for an Orc on the river Styx! this will be a special version of tutorial voting. Why? Massive Voodoo's year of the painter filled MV's article library up to 249 articles so far, means this article voted here will be number 250. A number we are proud of. Again you decided via comment which article will be up early next week. Three choices. 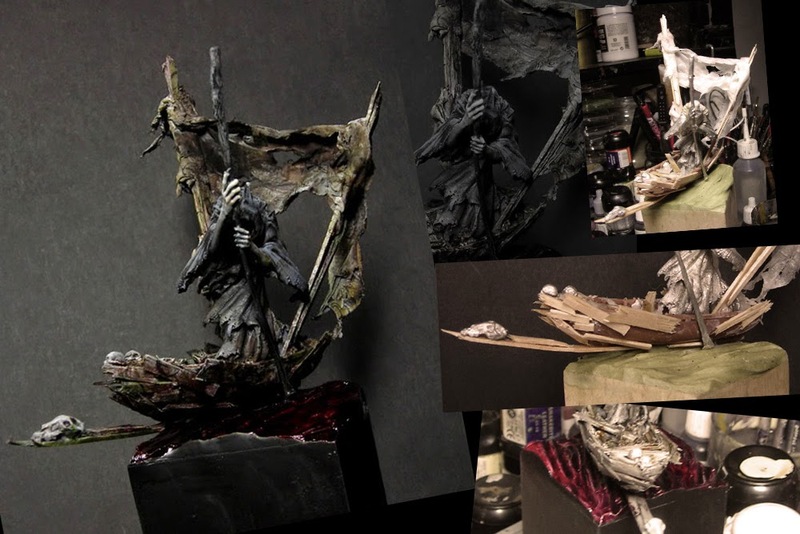 This article relates to a very old project of Roman, done in back in 2009, called "Rider on the Styx" and explains thoughts on the base, conversion of the boat and how to create a really worn out and rough canvas. 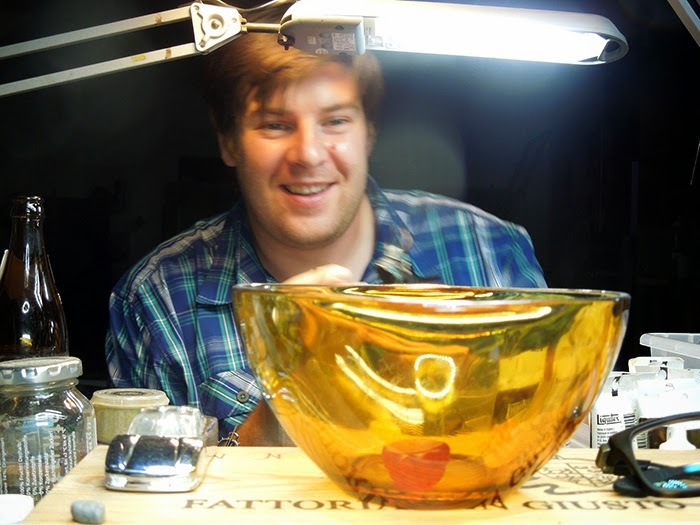 For this article vote "Styx" in your comment! 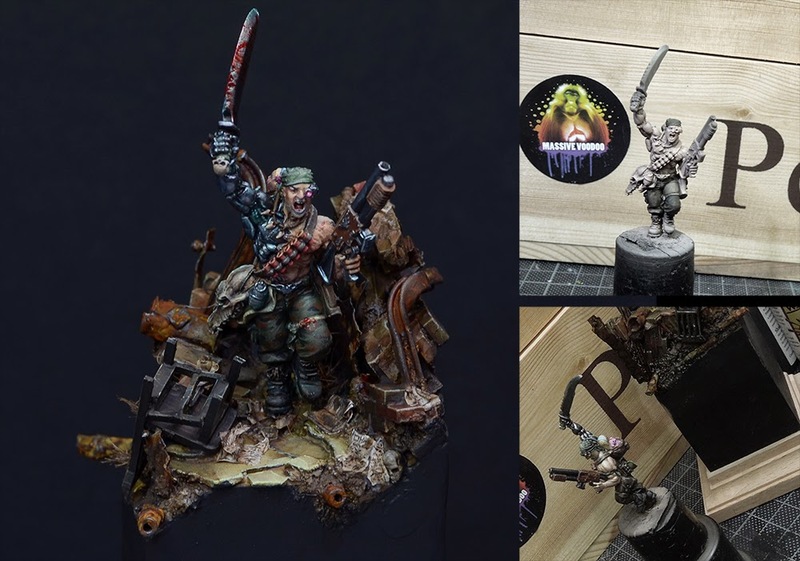 This article brings you a step by step guide on through Roman's project called "Her name is Hope", mainly a look at the paintwork done on Col.Straken from Games Workshop. 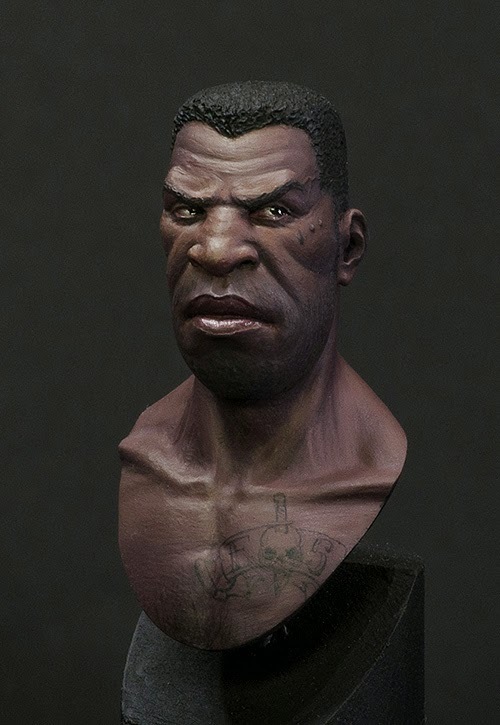 Cool bust "Jamal" is now available via Forged Monkey. It is the initial bust Roman lately has so much fun with. 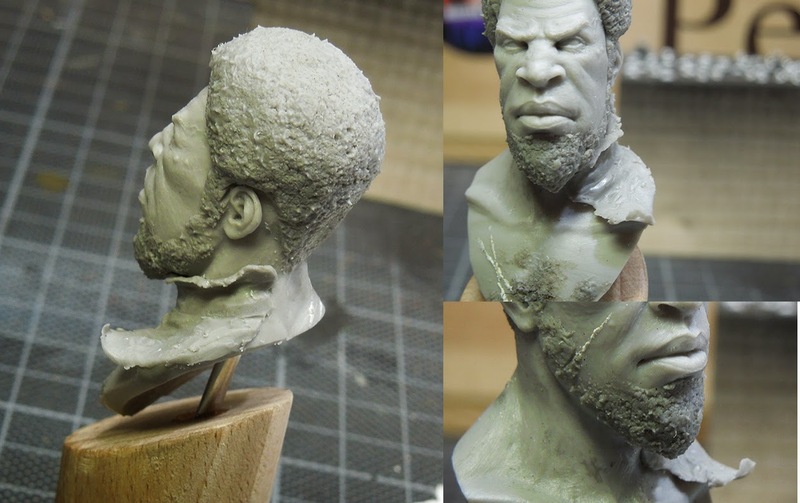 What will your "Jamal-bust" look like? 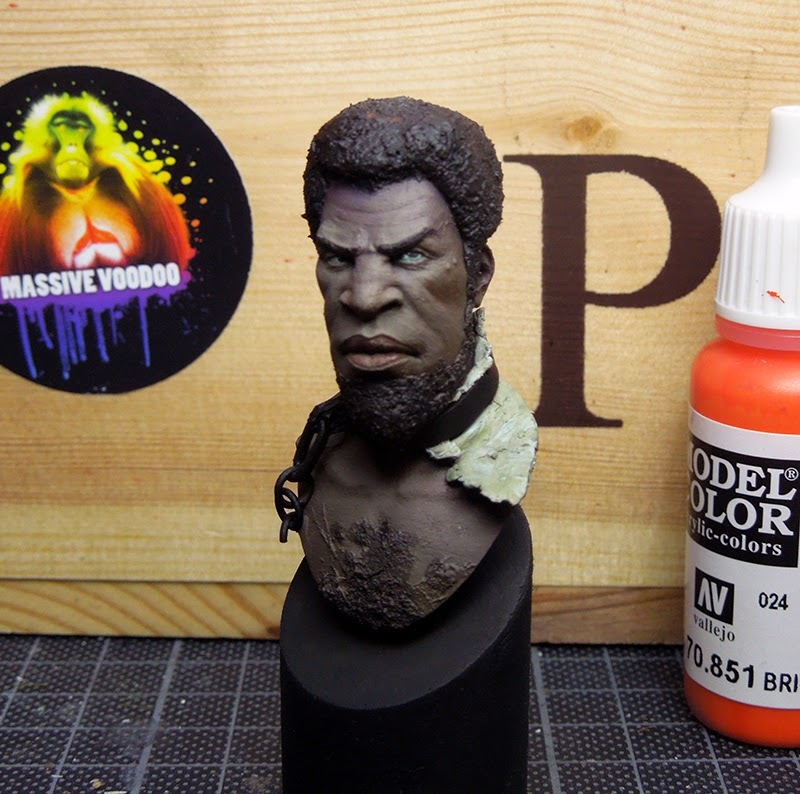 and welcome to another result of Massive Voodoo's year of the painter Tutorial Voting. Your latest votes decided pretty clear for a step by step on "Juva, 1883" and the Orc article might see light on another day. 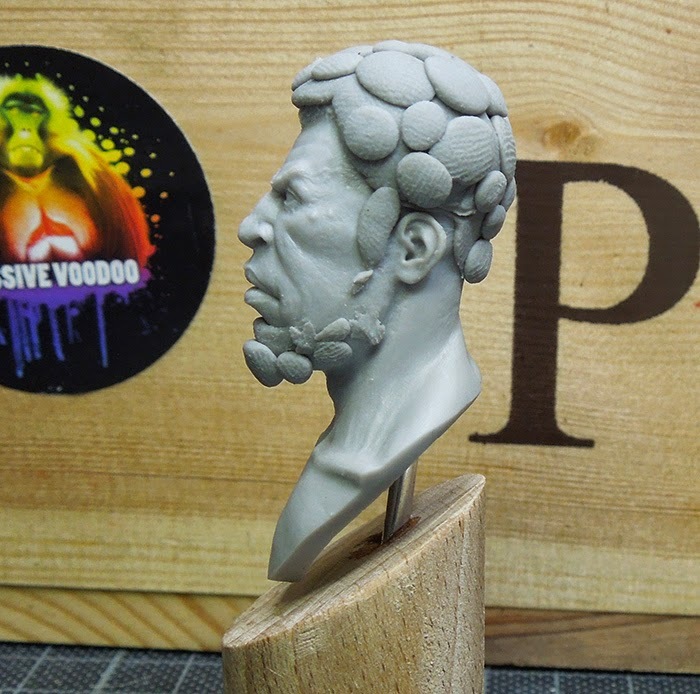 Roman is sitting down with some cups of coffee for you to open up his mind and explain to you what progress he went through by converting and painting this unqiue version of the yet unreleased Forged Monkey bust of "Jamal". feel free to drop a little donation here. 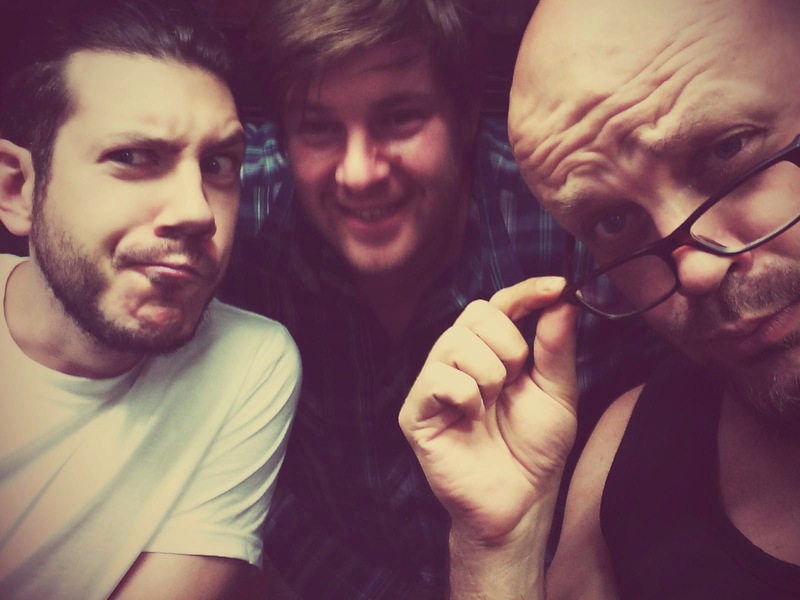 The MV Studio HQ can be a place of magic moments. Moments of inspiration, storms of creativity, massive creativity and sometimes also calm. Yet with this project there was no calm in sight. 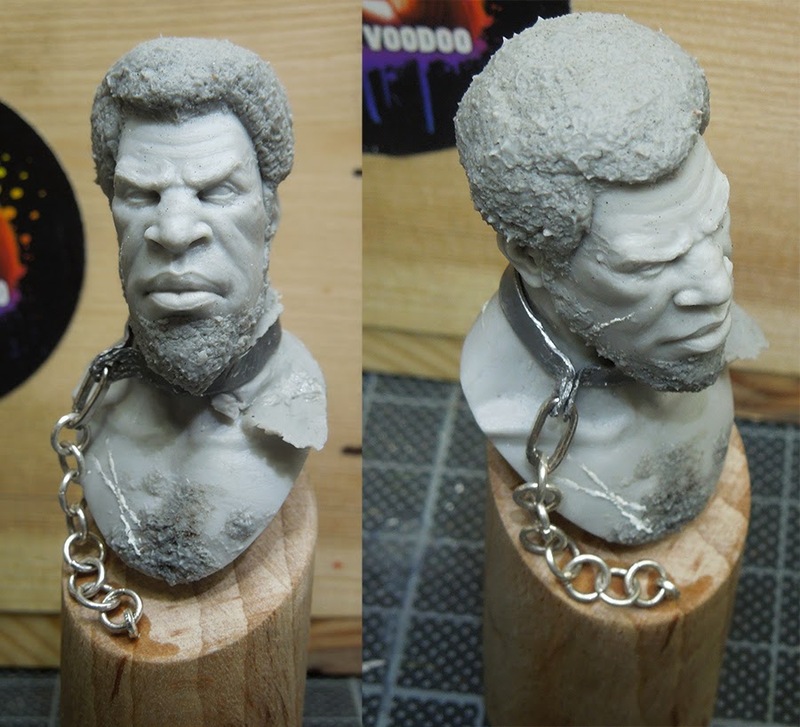 During Raffa's sculpting work on his upcoming, yet unreleased "Jamal" bust I knew I want to create some conversions on this beautiful sculpt. 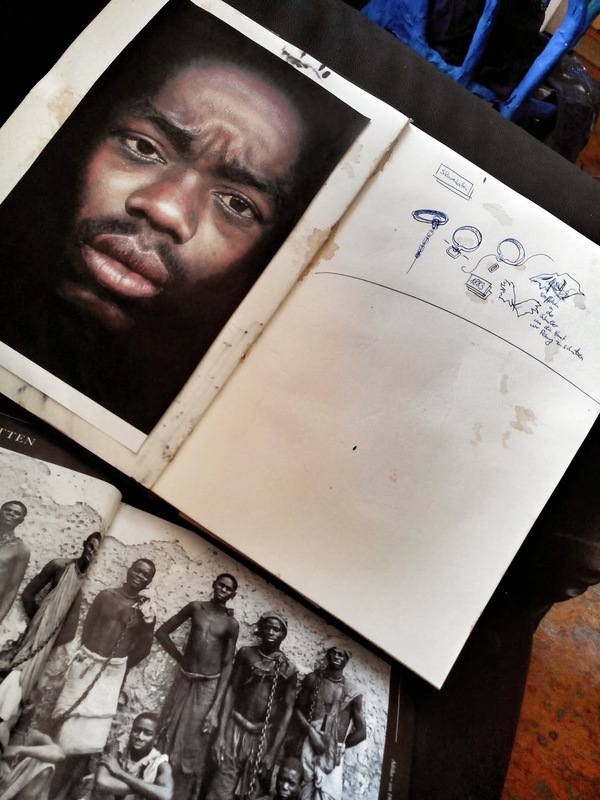 While I was reading a lot about Africa's history, I got more insight into this great continent and its history I found many frustrating, yet depressing historical passages which explained to me why Africa still might struggle today and will in the future. The free will taken by colonies and white cruel men, slavery and worse. All done on legal terms back in those days. It is nothing easy to chew and get yourself into it. The heart and soul hurts while doing so, but I don't want to talk about my mind on that matter, if you are interested, get yourself into it and face a dramatic truth. 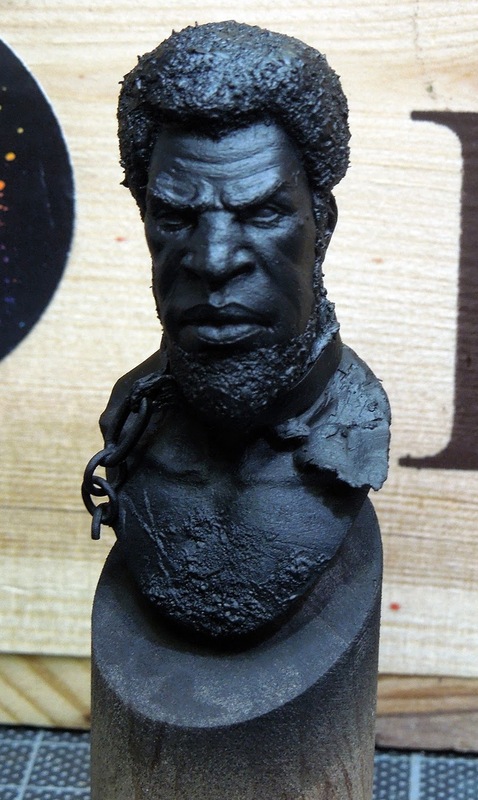 I decided that my first conversion of "Jamal" should be a slave, his life stolen from stupid white men. In chains that will lead him far away from home. A sad man. 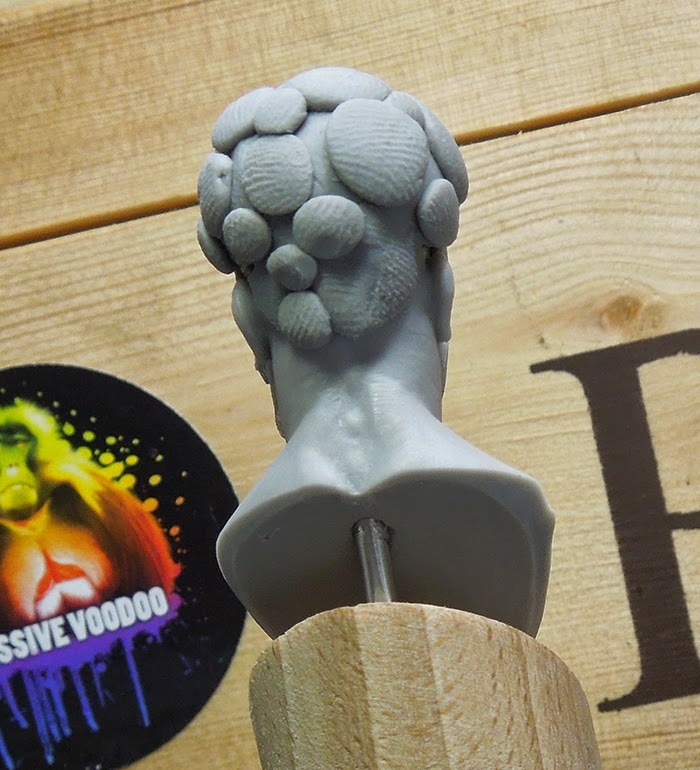 Using BeesPutty I went for a cleaned and already up to a plinth Jamal bust. 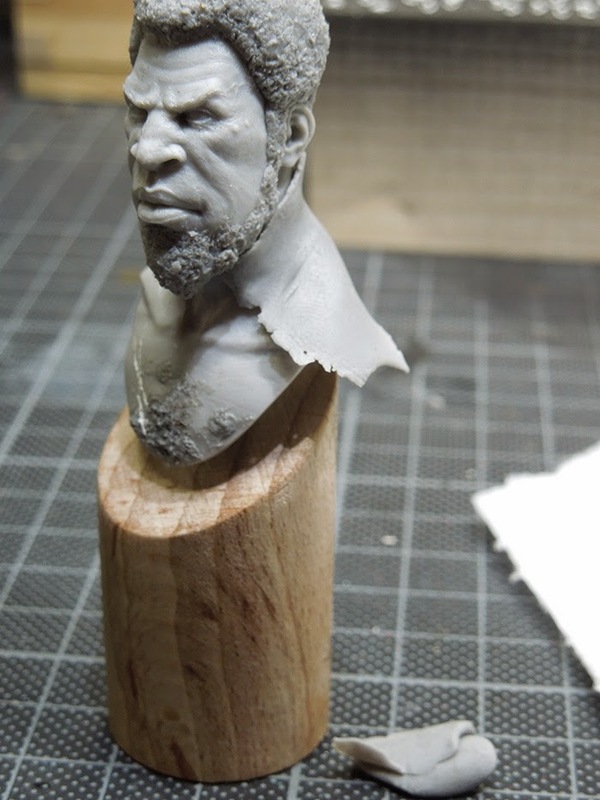 Rough volumes for the hair and the beard were put in place using my fingers. 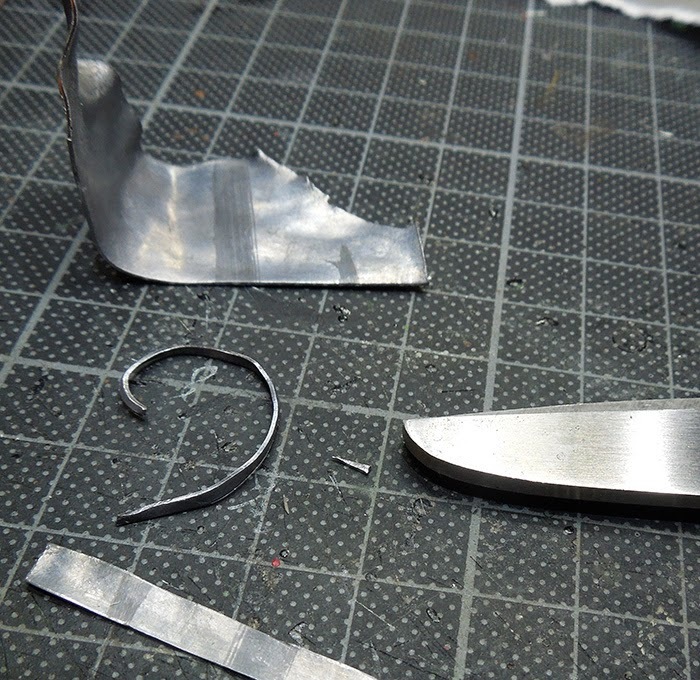 Next I used my fingers anmd a sculpting tool with a flat 45° working surface to smoothen the BeesPutty. 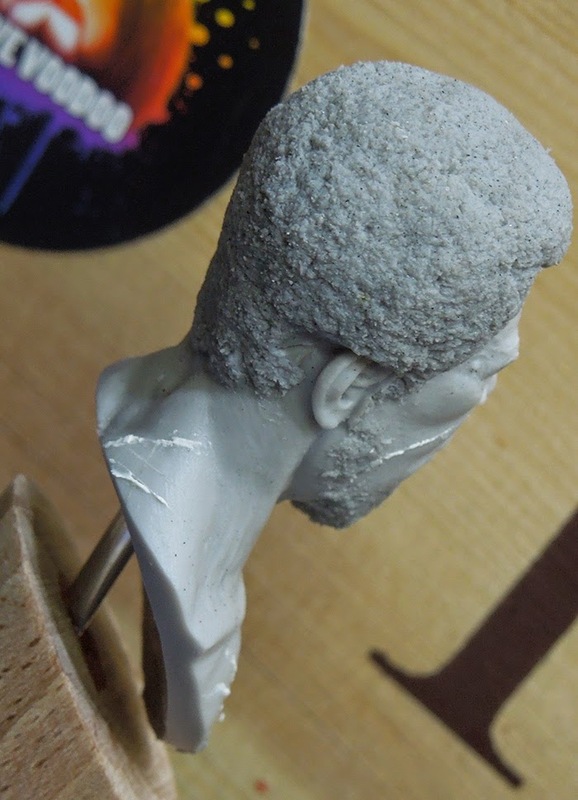 I used foam, pressing it to the now well shaped Putty and textured it. I planned to give "Juva" some scars to show that his inner strenght will never be broken and that he is often struggling to accept his forced fate. I think during this step I already begun to switch from a sad man to a man full of revenge and anger. Pretty graspable I'd say. 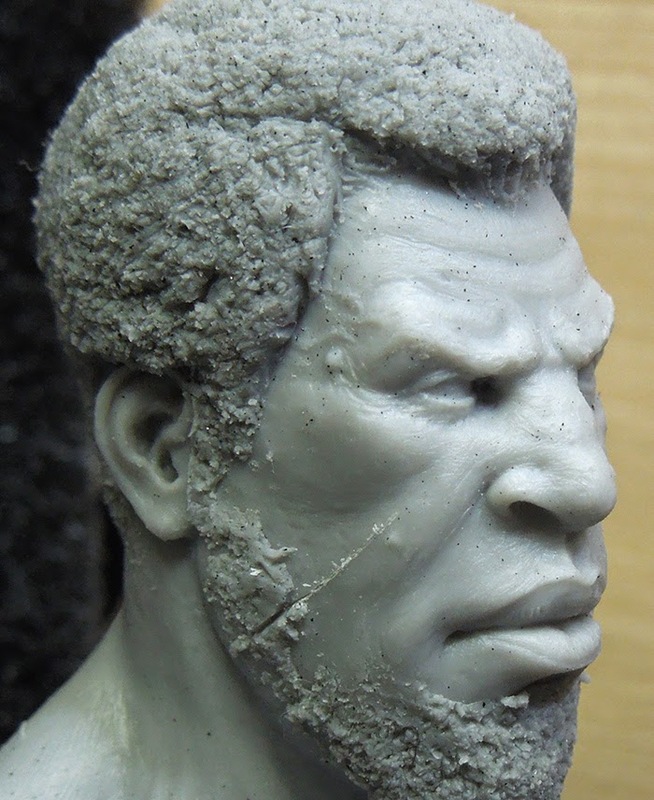 The scars have been done with Vallejo Putty 401 and a toothpick. Similar to the tribal scar article over here. Now I baked the BeesPutty for the first time in the oven (20 Minutes/90°~100°). Always check back in a while when you put a model in the oven for baking. Just check for accidents, like the model melting or falling over or burning. Just check back. Or go there to tell been there, done that. For the hair I wanted a more feral look and used White Spirit + BeesPutty, mixed it about 40/60 and created a clammy version of BeesPutty. This was no put to the baked hair with the use of an old brush to create little tiny difference in his twirls. Dabbing the old brush with the mixture on it to the hair several times will just leave small remains. That is what I am looking for. See the black dots on the resin and in the hair? 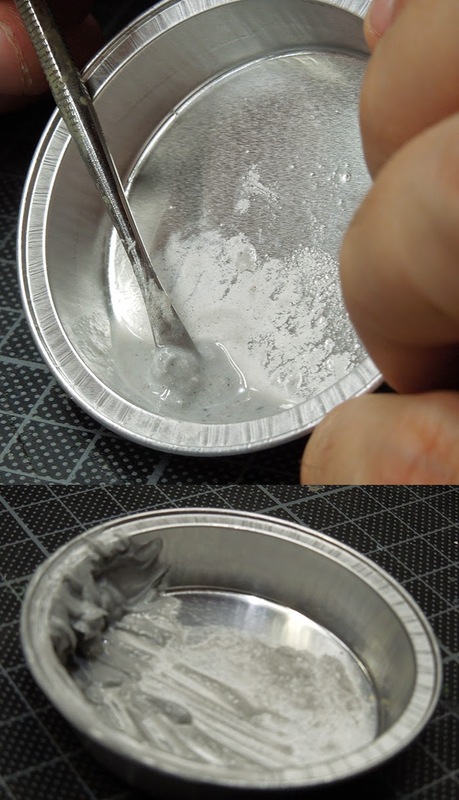 Well, that's from using the foam, but will be cleaned before painting. I did the same to his chest hair. Then I baked the BeesPutty again to secure these little curls. Now the project started to feel really strange. 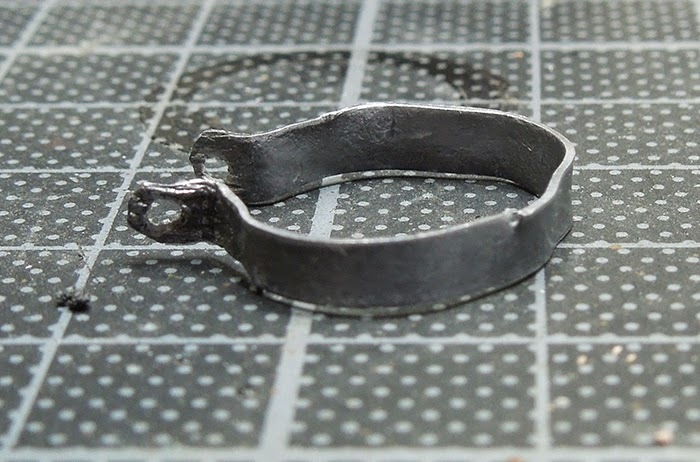 Creating the slavery neck chain from thin aluminium sheet I got from Modulor. With a nail scissor I cut the material I was in need of and formed it around my small finger, always checking back with Juva's neck. This feels really strange, believe me. 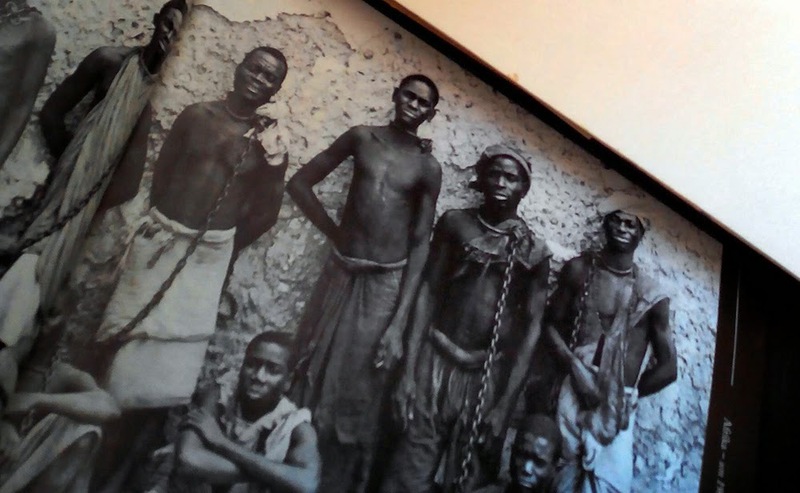 ... but before placing it I decided to add a small piece of worn clothing like some of the men on the photo had to protect their skin from the metal of their chains. Using BeesPutty again for it and checked back with the metal part I prepared earlier. When I decided I'd be happy with the fitting I carefully moved the clothing into form and baked it. Now the neck ring was put in place, fixed with parts of some jewelry chain. Honestly this moment was truely hard to really close that chain around this man, making him a slave. I can not really describe my feelings on this part, I can only tell my emotions were huge. First the chain's lenghth was planned to go down to the plinth but I decided different and shortened it were the bust ends. 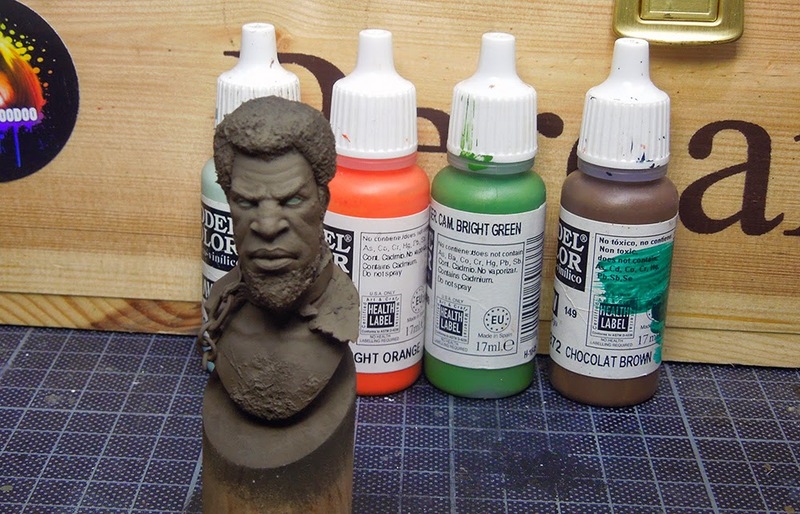 After the bust was primed black I had to go for a basic tone. 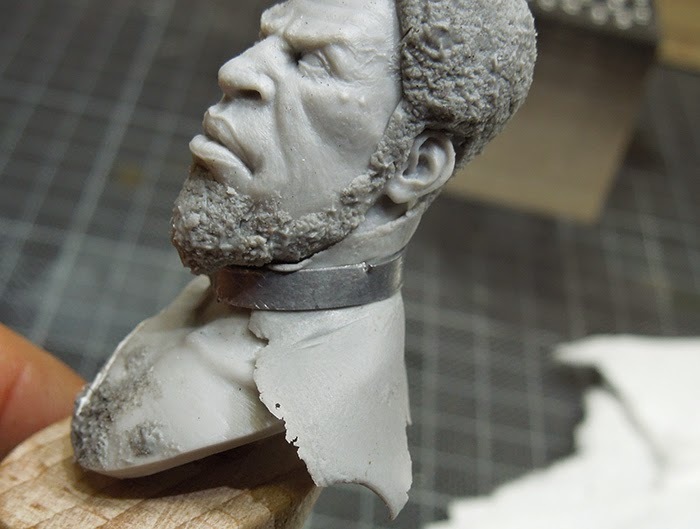 Here is a photo of the black primed bust, ready for some more colour. 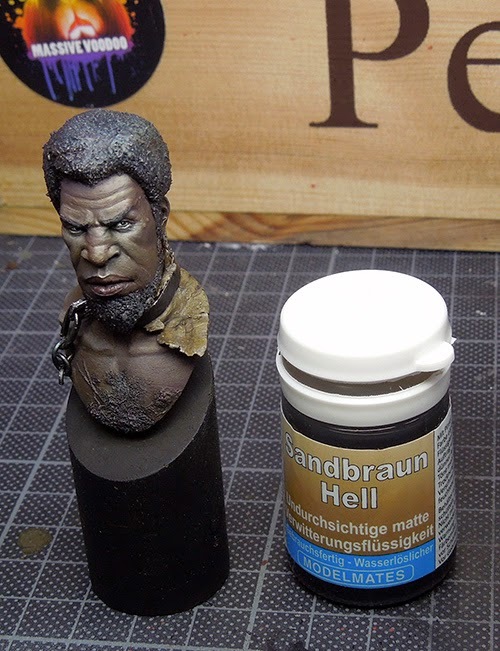 I made up my mind for the basic colour for the skin and went for a bright, little desaturated sandy brown. Plan was to go from there. Not taken straight out of one bottle, rather mixed up by the colours I felt to be the right ones for this task. 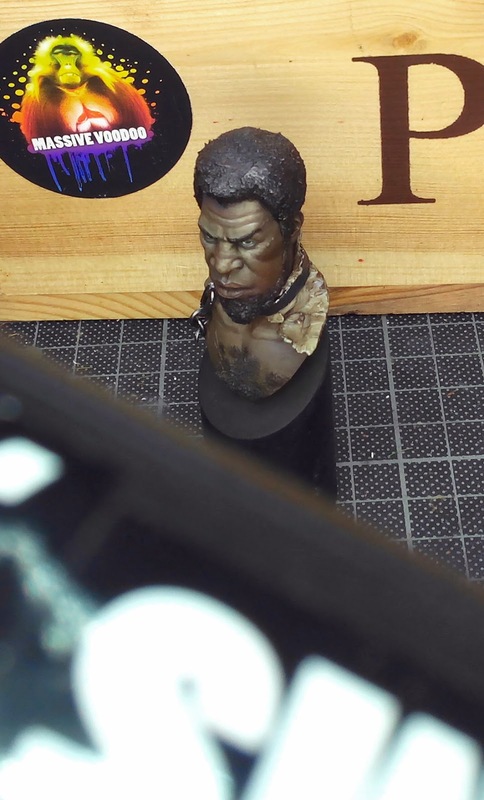 I used the greenish/brown in the left upper corner of my wet palette and airbrushed it to the whole bust. The eyes have been painted with a mix from green/cold crey as a basic tone. 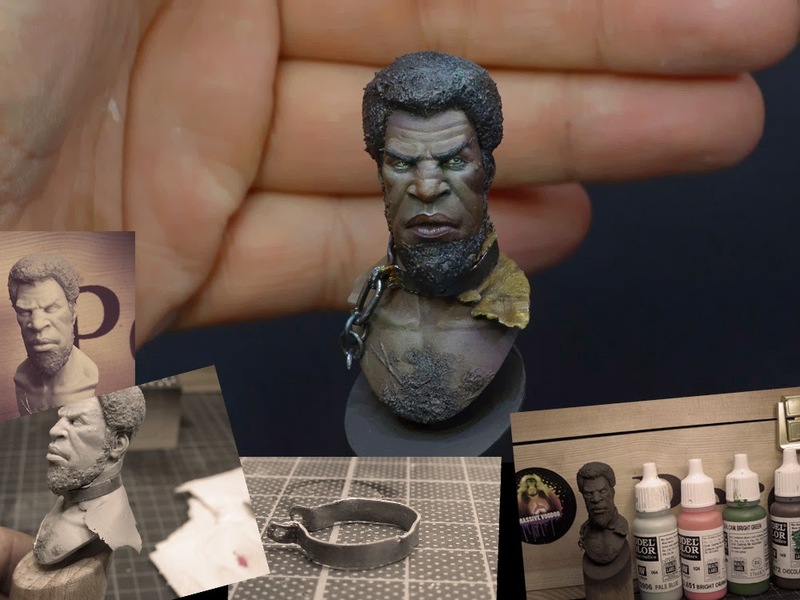 Next step was closing the picture more by painting his beard in black with a touch of brown, well I started rough with the brown first and then mixed in the black directly on top of the hair. Closing the picture even more I decided to give the clothing a bright sand colour to make it darker again later on. 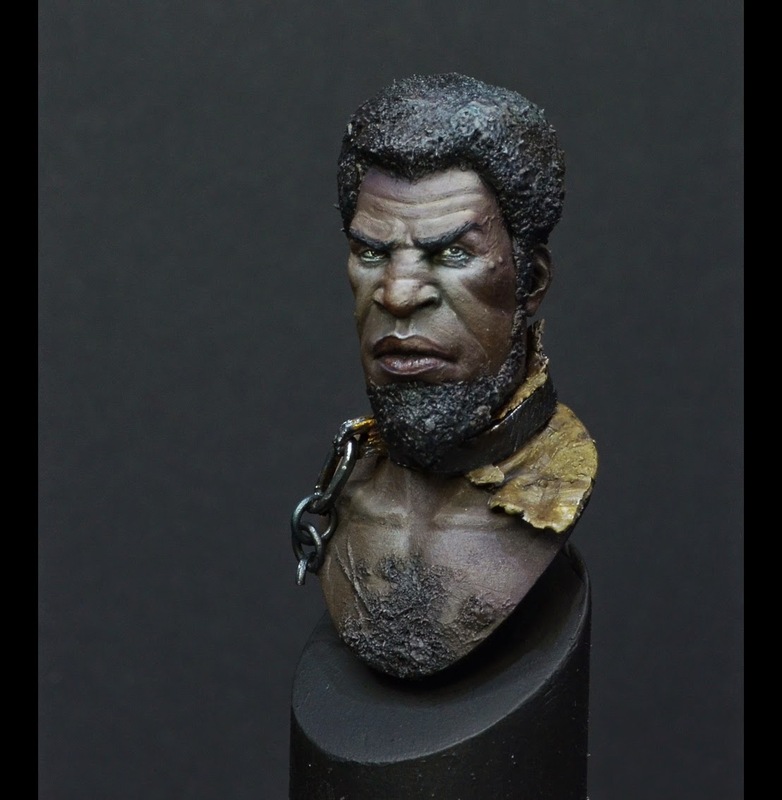 I carefully tried myself in mixing in more of the cold grey into my basic skin tone to paint first gentle highlights to the skin. 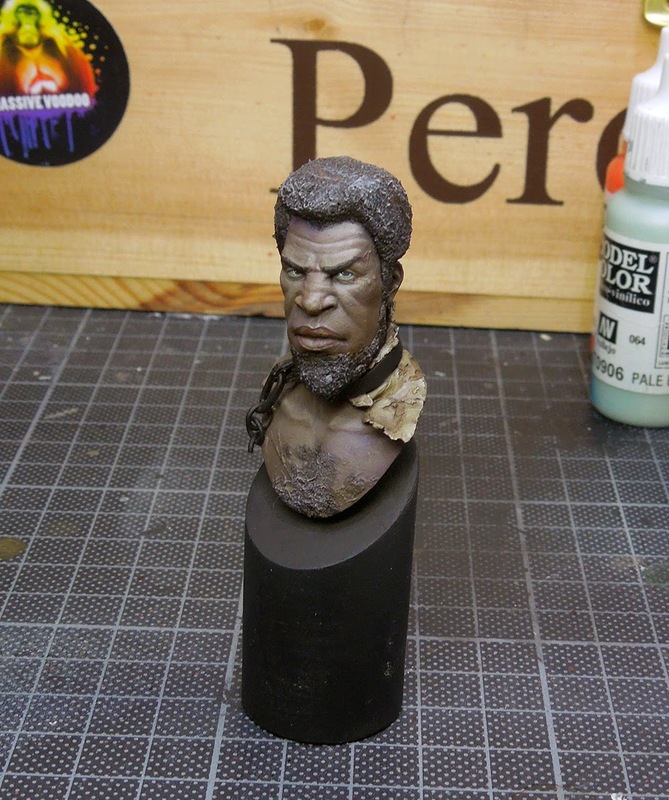 Painting the planned metal parts in black at this stage too and carefully tried a first glaze of purple in the skin. 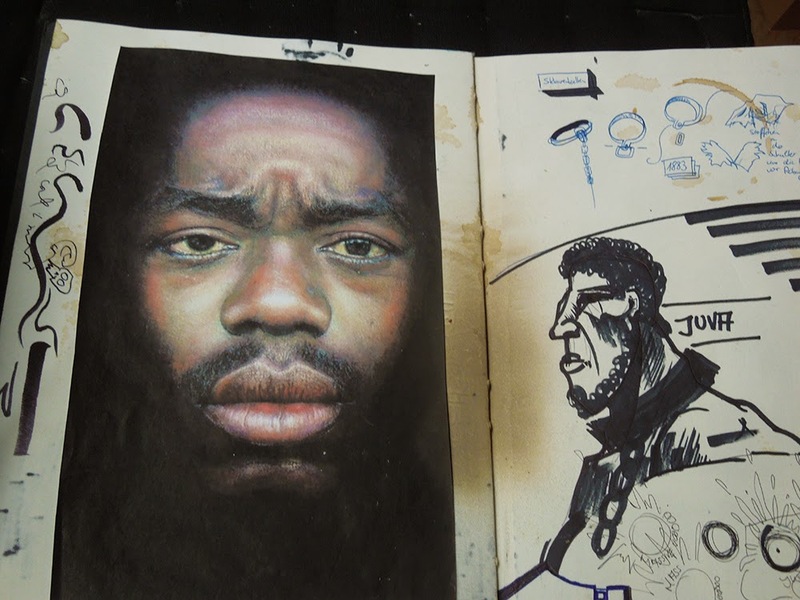 His lip was glazed with Hull Red to give it the same basic appeareance like on my inspiration guideline. 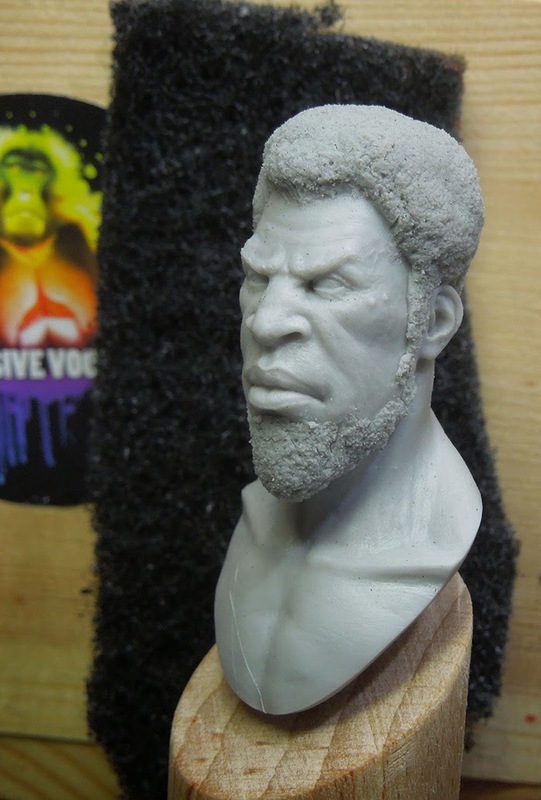 Next step was using more cold grey in the mix to intense the contrast range in the skin highlights, but placing them in smaller areas of the initial gentle highlights now. 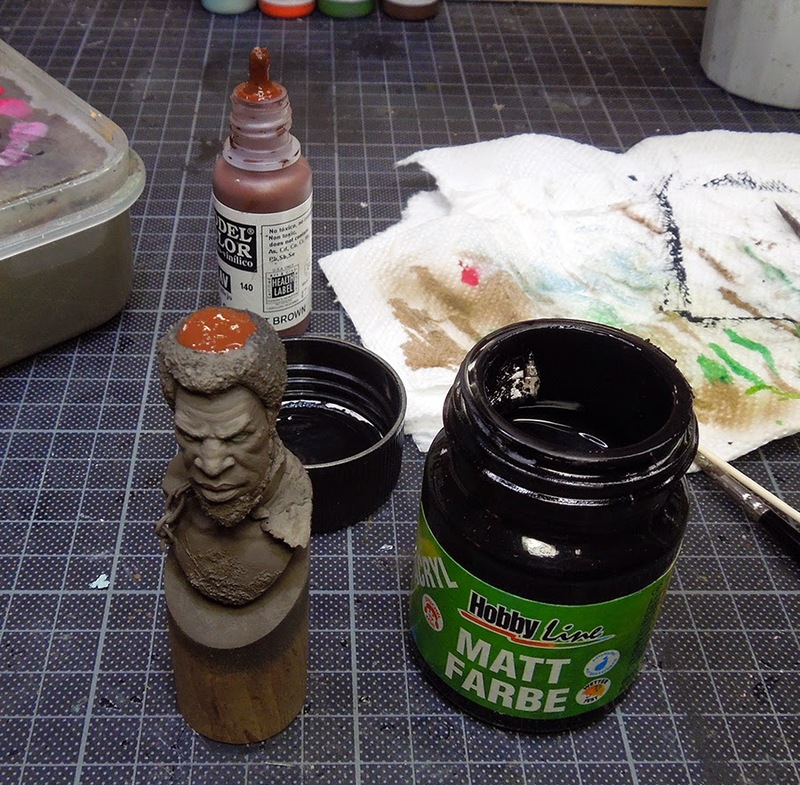 Using Flat Brown glazes on top of it as it felt too strong. This glaze made it a unit again. Time for drybrushing the hair a little bit with the greys. Making him look a little old, but the plan was to glaze black on top of it again. The clothing part recieved a wash from Army Painters strong tone. Now I really had enough of being shy and decided to go for the highlights in full force. 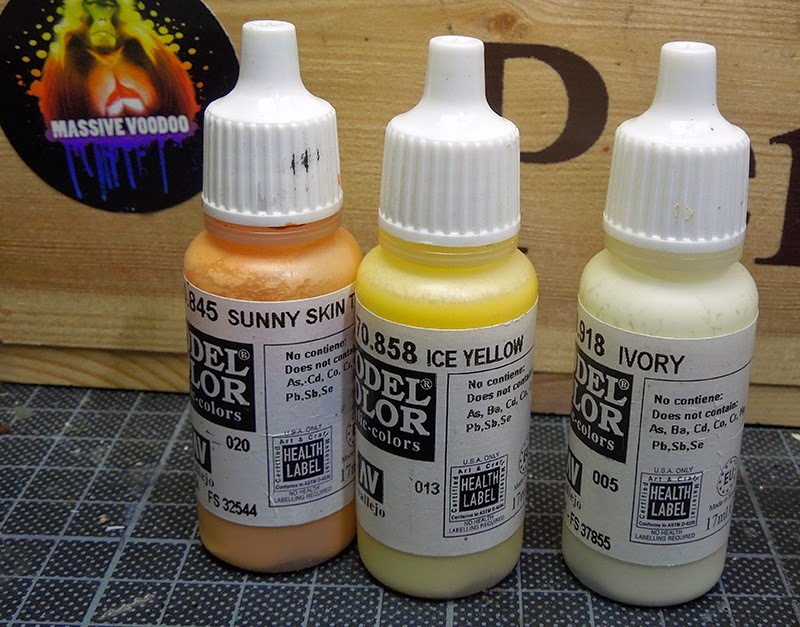 I used the following Vallejo Model Colours to try mixtures for my highlights, adding them to my so far mixed colours. 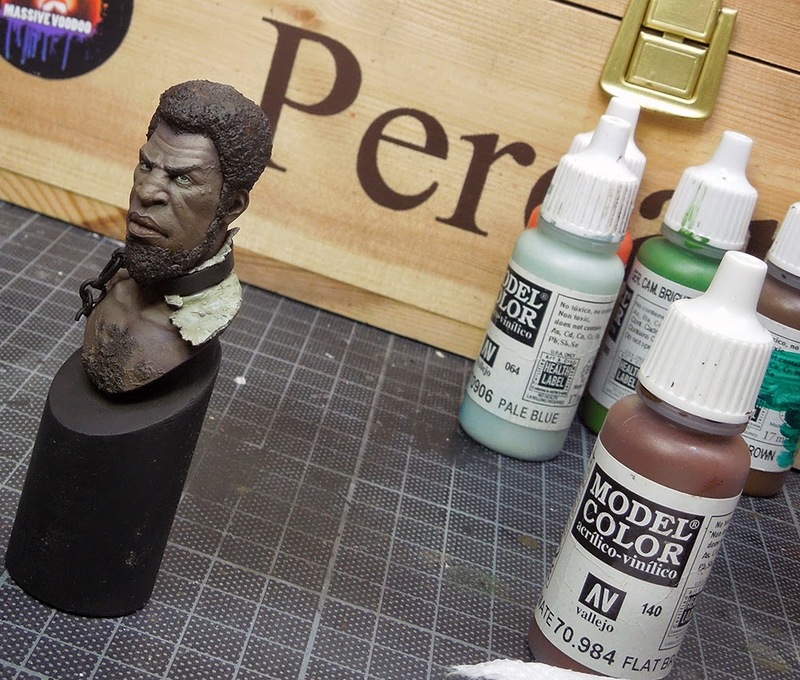 Carefully working my way higher into the highlights of prominent spots in the face and glazing them again with the Flat Brown, but soon realized that only using flat brown would make it look strange, so I mixed in orange, greens and purple into the glaze to smoothen my painted highlights. 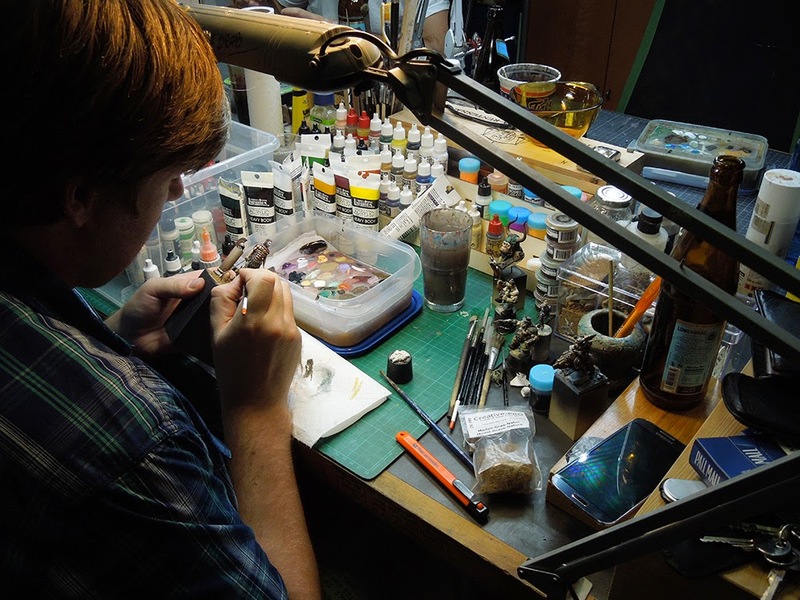 The metal parts have been painted in very dark metal, using Scale75 black metal as a basic tone, followed by heavy metal for the highlights. I repeated the upper step several times to intense the range of contrast. On top of the clothing I went with dark sandcolour from Modelmates to make it look old and worn. 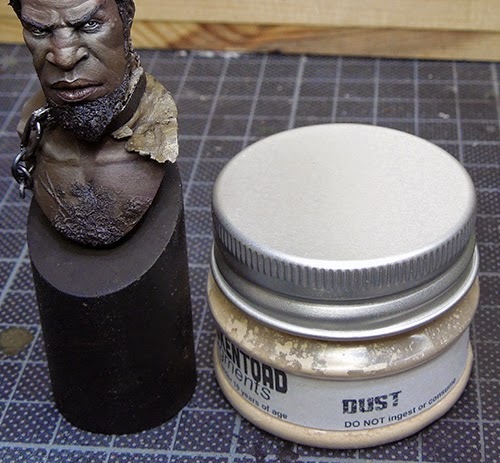 Followed by some dust work with pigments. Now seeing the picture coming togehter I went more brave. 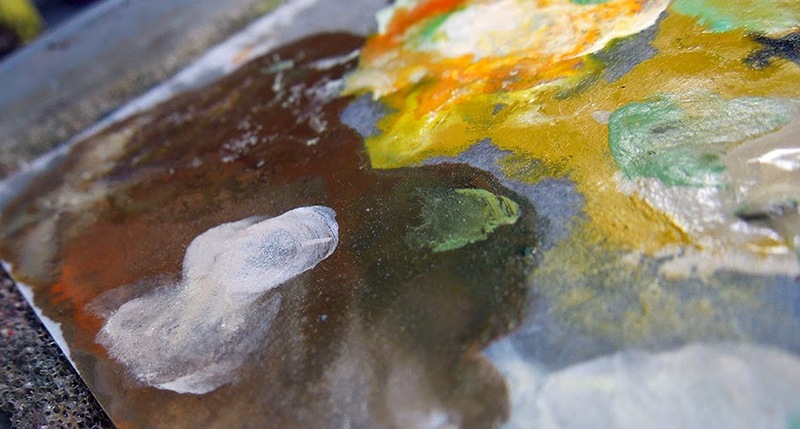 The last steps on the bust have been adding a lot more colour variations in form of thin glazes of purple, green, orange, yellow and red to the skintone to recieve the rainbow of colours that is visible in my inspirational artwork. 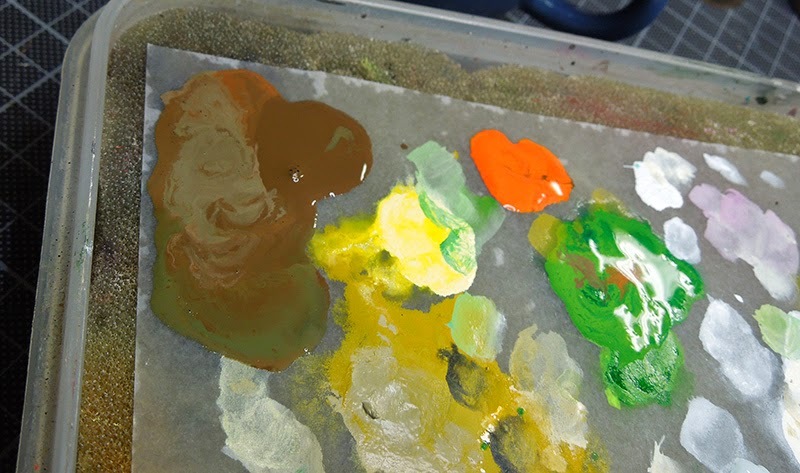 These glazes also lead to smoothen the highlights that look to harsh. 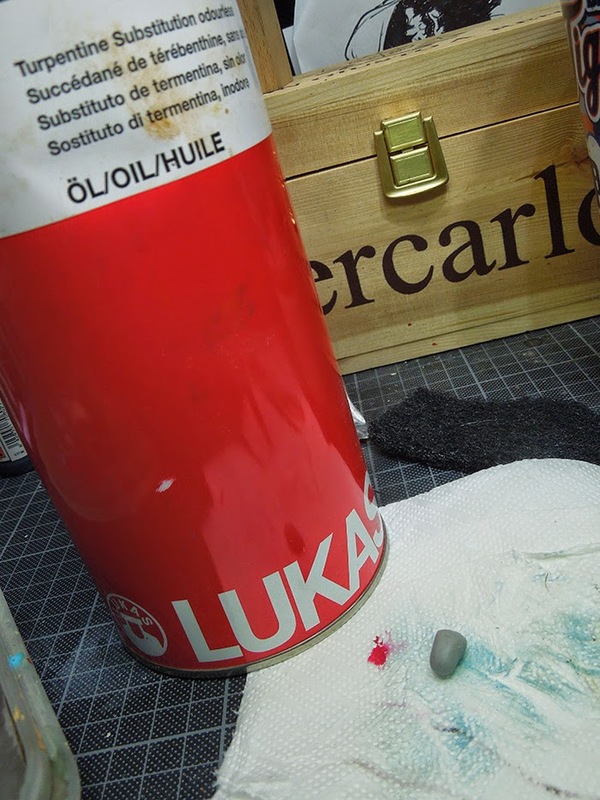 I had to repeat the step several times, saying: Paint a small highlight, then glaze it over. Again. And again. 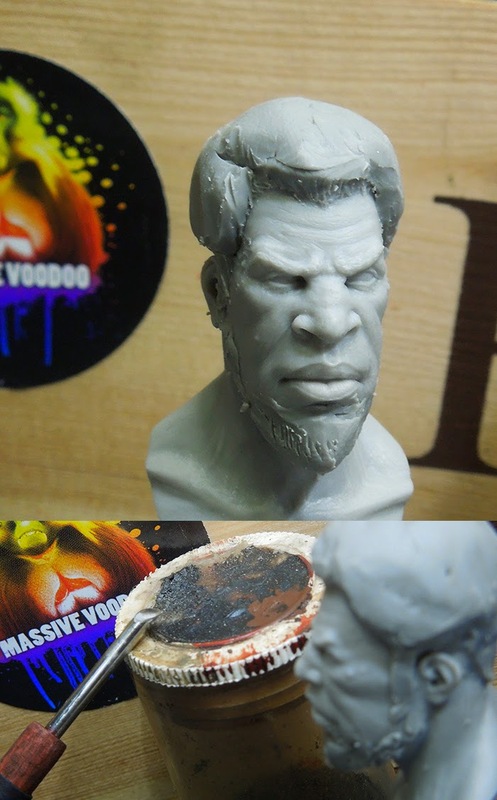 I went for the colourful glazes into really detail if you take a look on the nose/eye or mouth area. There is much happening there with gentle colour changes that make it look look more realistic in my eyes. 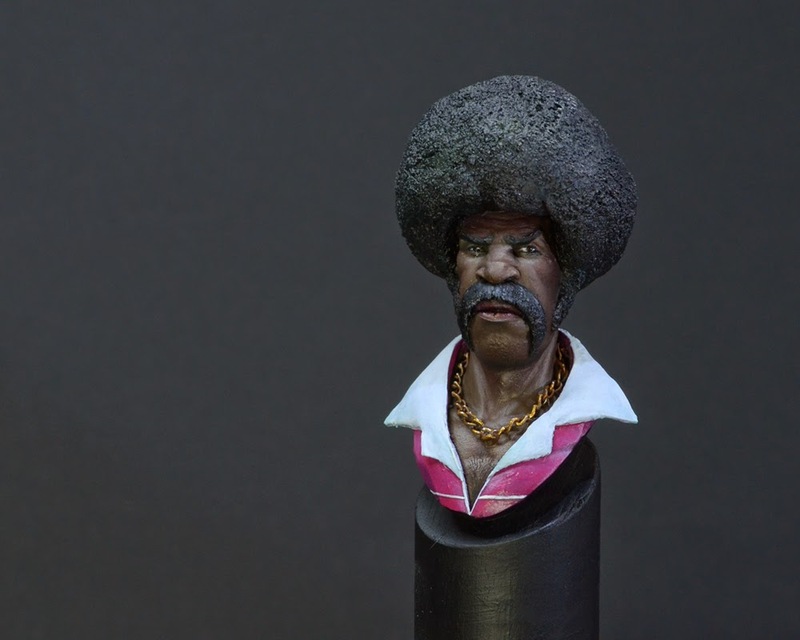 Somehow I was pretty happy how the black skin turned out by not painting it black or dark brown with light and shadow at all. All those additional colours brought that skin to life and I would even say I have done a little too much if you look at it from a natural aspect. What I have learned from the past is that overdoing something is a good way to understand and learn from it for the future. I enjoyed pretty much to see me initial plan of a sad man change direction to a man with a strong will of revenge, still a king in his heart and soul. I hope you enjoyed the article - let me know what you think and let me know if you got questions, I try to answer them as soon as possible. 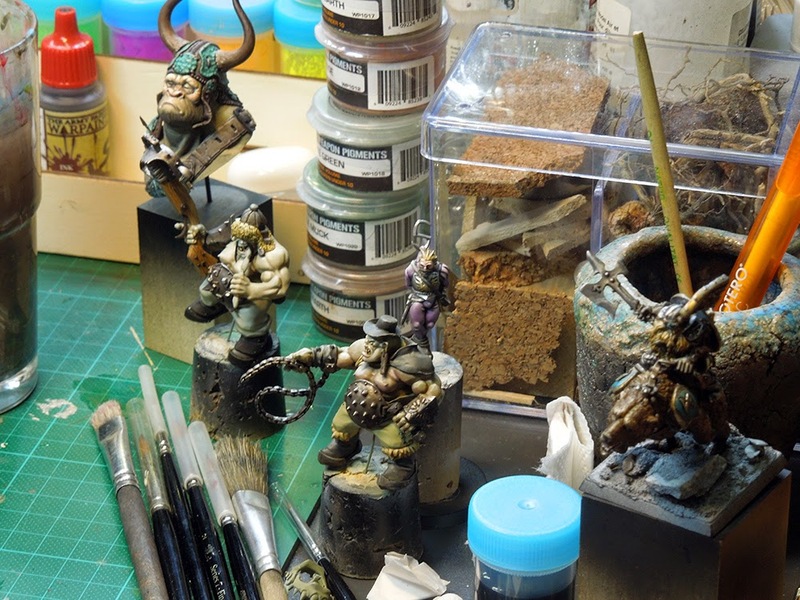 today let's have a look on my workbench via some WIP-insights. The last of my WIP-thoughts can be found here. 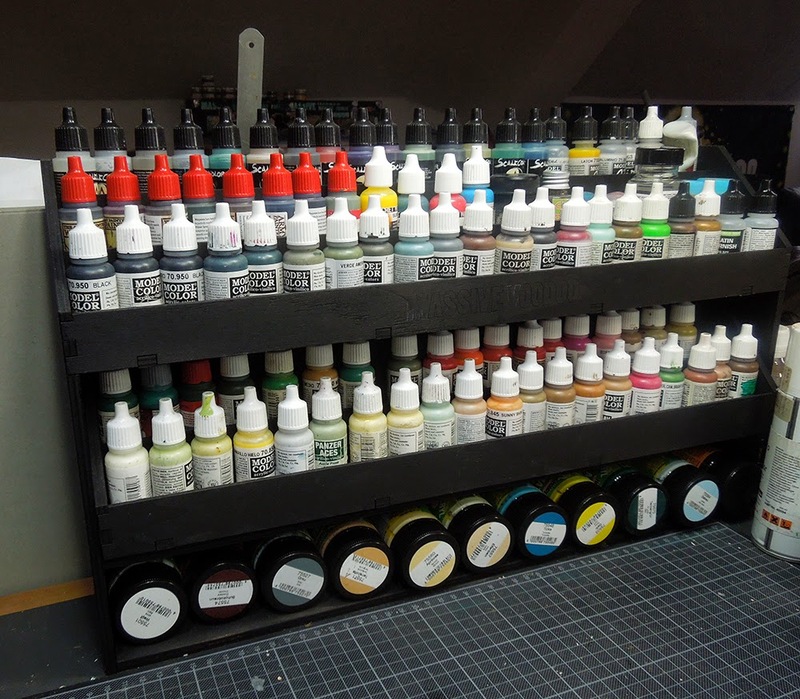 Well, first of all I have to say I was pretty busy with getting all the stuff ready for my upcoming basing class this first weekend of August. 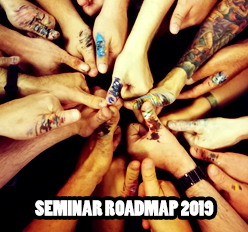 Hell yeah, I am looking forward to it so much and I am really more than corious to see how my thoughts might hopefully help the participants to create their own bases with more fun. 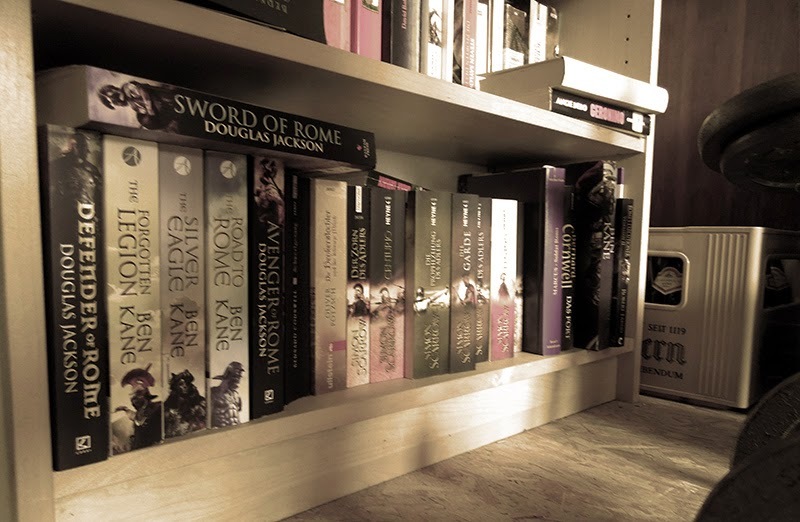 Second, I can say that I am still reading like a madmen and for 6~7 months I am now stuck to ancient Roman literature. That is pretty weird as I usually switch themes of my readings, but Rome got me totally. My bookshelf in the studio is close to burst as one book after the other get sucked into my soul. 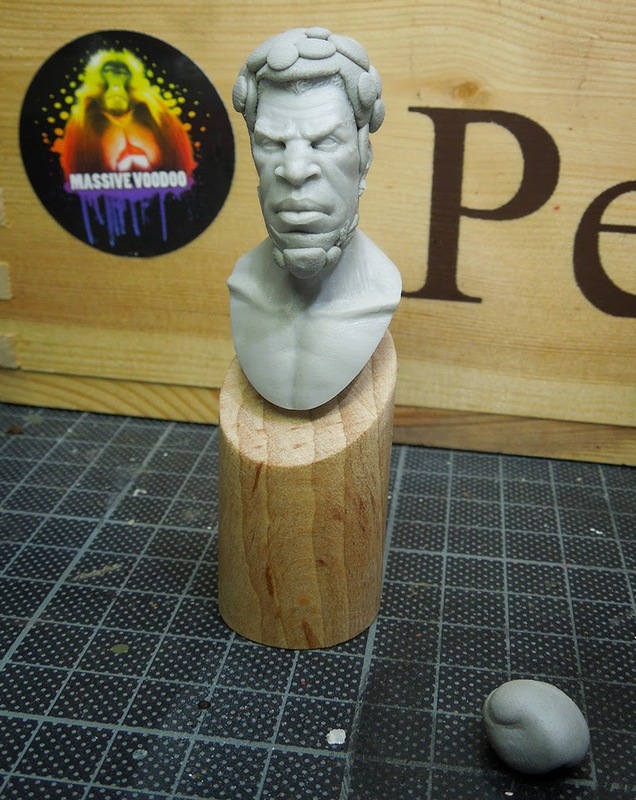 It might be the right time to do another ancient related bust or figure soon, so I decided to pick up a long timer. 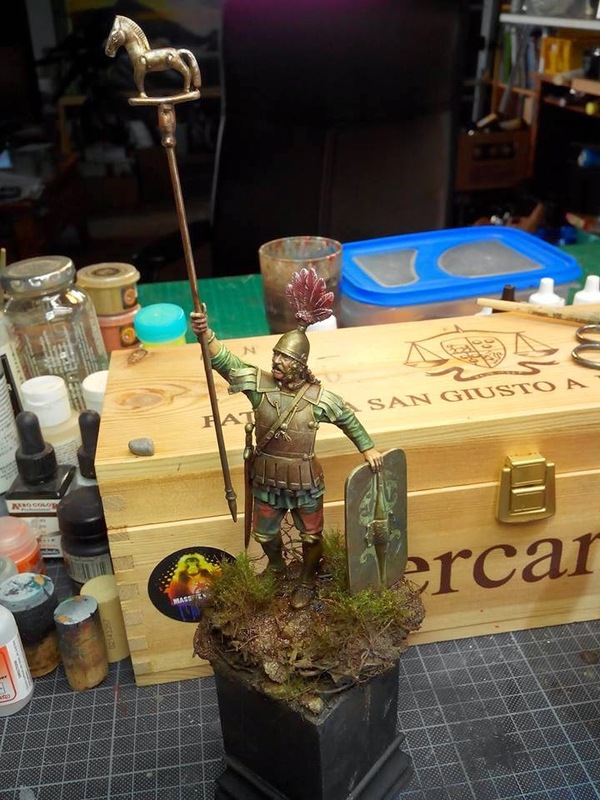 A greek celt from Pegaso Models in 90 mm whom I started a long time ago. Now I am sitting down to finish this big monster. 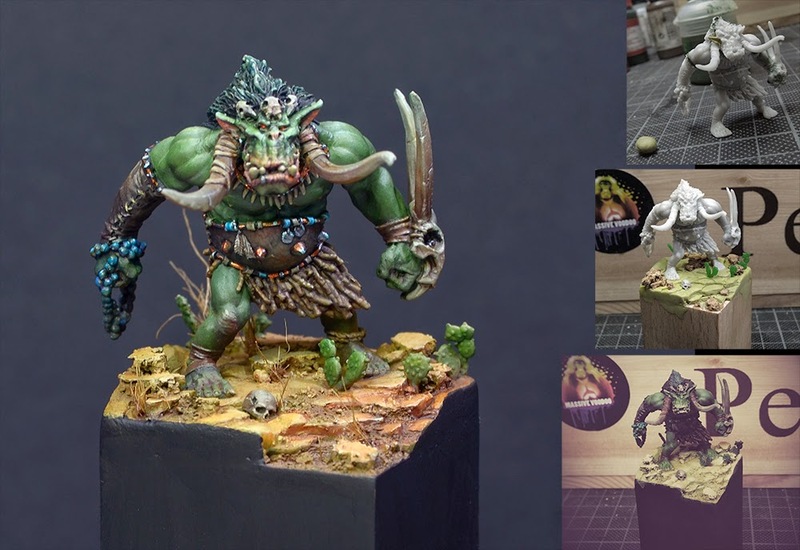 I am preparing a really interesting article on how to paint yet another cool Hasslefree model with just using five different colours, which is really a lot of fun. 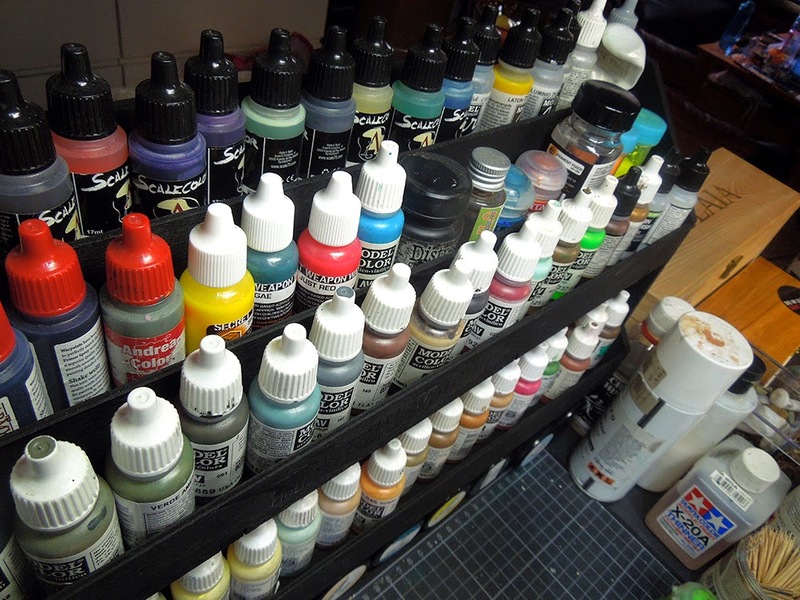 One thing I have to mention is my workspace organisation: I was pretty focused on using my old colour carrying box for my colours but the Ultimate Paintrack convinced me so much that I said goodbye to a long time love. I wanted my version of the Ultimate Paintrack black so I painted it black with a big brush and black colour. 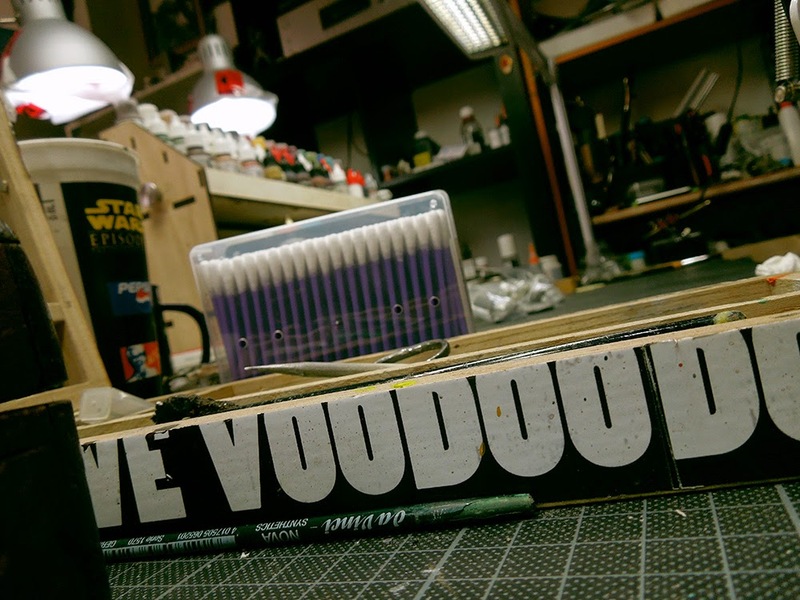 Soon I plan to paint the cool Massive Voodoo writing in pure white. I'd like to show you what I am storing there and how I use it. It is not standing in front of me, rather on my left side, which I personally prefer. As you can see all sorts of my colours do fit in there. It's truly magnificant. Get your Ultimate Paintrack! Click the banner to see all information! The last gummi bear will be soon annhilated. Andi doing some focused painting work. ... on several projects at once. Friday night was so nice that we spent Saturday also with painting, even the sun tried to grill us in the studio. 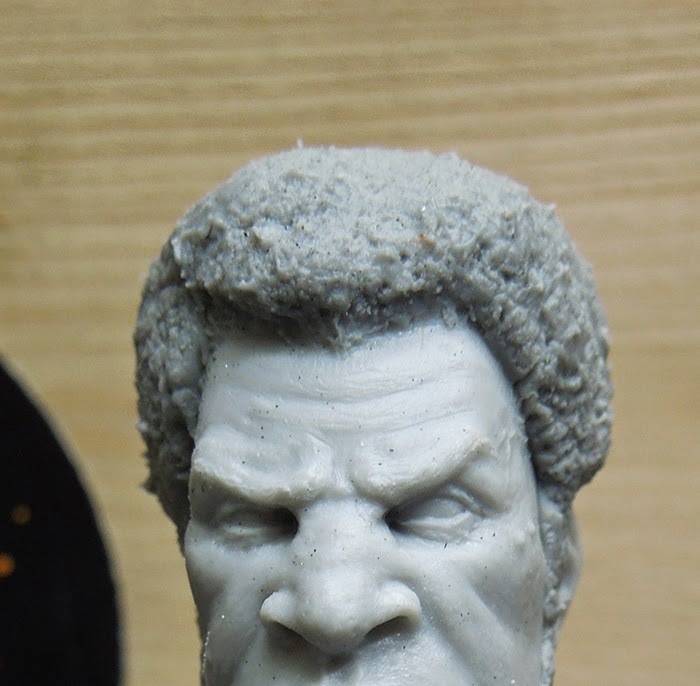 Andi was able to finish his greek model this day and went home ultrahappy after a beer together on a local beer feast. Well, about the Inuit and the fish: I am waiting on recieving a proper plinth for him before continuing the work on this monster of a bust.